If you’re like me, after a long day of work, digital devices and then some, you want to get home, curl into a ball and just relax. That however seems to be more of an ongoing dream once you venture along the parental journey. The reality is, with school preparations, work, pick ups and drop offs, dinner, homework and everything in between, parents are often flat out tired. 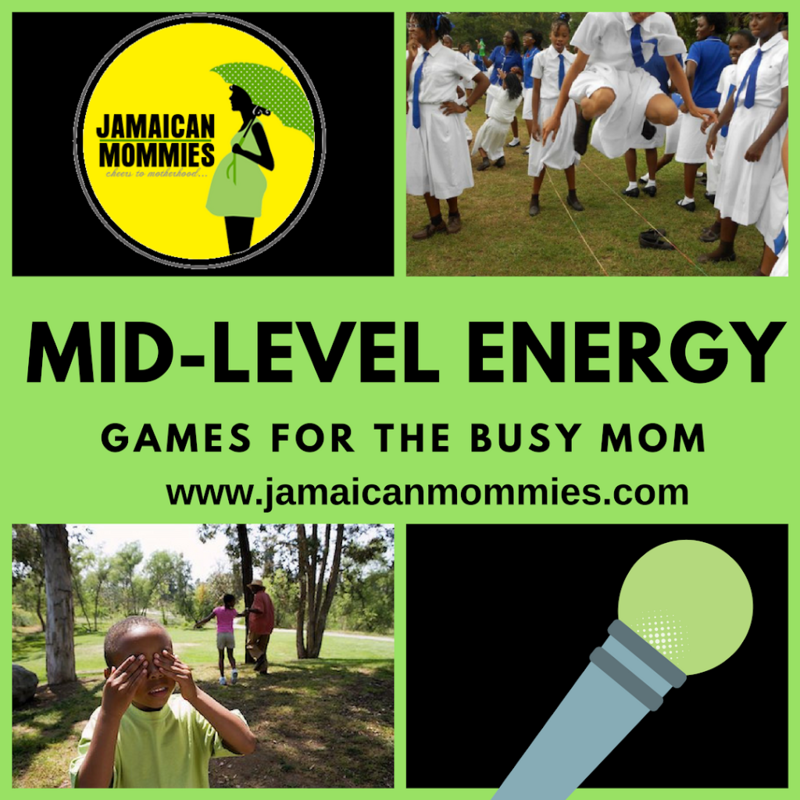 Still, while our energy levels seem to be running towards E, our children’s energy is often at the peak, operating on a full tank. 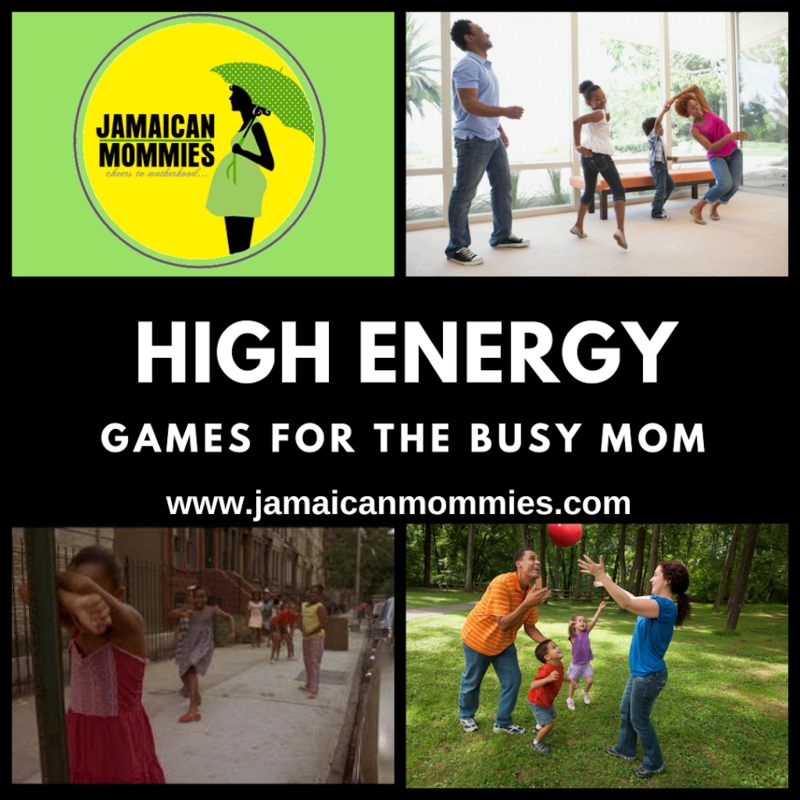 Since Jamaican Mommies has so actively been encouraging parents to #JustTry to PLAY, we reached out to several moms across the Jamaican Mommies network at home and in the diaspora to find out some of their favorite family games. 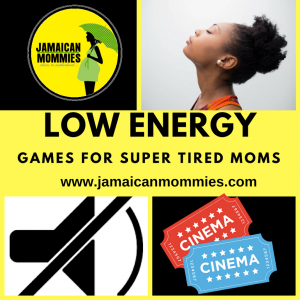 We collate the responses and share these, categorized by required energy levels. 1. Spa Time: My absolute fave because it requires little to no energy on my part, but allows the kids to still have fun. Spa time can range from having your hair, nails or a mini massage done. Required: One or a few excited children, a super tired mom or dad, a comb, brush and other spa items. Method: Relax, close your eyes even and give your children free reign over your hair, nails, shoulders etc. Caution: Don’t be alarmed that your hairdo isn’t road worthy or you have mismatched painted toes. Method: Close your eyes, keep the timer going, enjoy a few precious moments of peace and quiet and bask in the silence as your kids compete to be the most silent in the room. Then pat your self on the back for being the most clever parent ever. Reward the winner and all other participants, knowing the next time around, they’ll compete to be silent for wayyyy longer. 3. Movie Time: Another fave because Prep time often includes my 9 year old picking the movie while I make a batch of popcorn and drinks. Method: Watch for 2 minutes then sink into la la land on those fluffy pillows. Ok. Perhaps, this one should be reserved for more high energy days as my daughter has begun complaining bitterly that I always fall asleep. 1. Sing alongs: Sing alongs are great for just about any age group and are a perfect excuse to take your bathroom only voice out into the open. My daughter and I even go in full performance mode for songs we really love such as our rendition of “Rock a Bye Baby”. Method: Scream, Shout and Let it all Out. Caution: You may be stopped several times for screaming, or screeching too much or even called out for hogging the song. Proceed with caution. 2. Hide and Seek: Listed as Moderate because it still requires some energy on your part when its your turn to seek. Required: Seekers (Never volunteer to seek first) if your energy reserve is leaning closer to E, Strategic hiding spot. Method: Ensure you are the last to be found! With enough time, you’ll be able to compile your things to do list, close your eyes, breathe, think about life or even grab a nap. 3. Chinese Skip: Also known as Chinese Jump Rope, this game involves players who do various jumps on the ropes and endure challenging rounds, As the jump rope is hoisted higher and higher, the game tests your jumping and balance skills. Required: Chinese Jump Rope made from varied elastic bands fitted together; 2 jumpers and this is where it becomes moderate. Unless you are leaning towards the high energy scale of the energy meter, ALWAYS volunteer to be the “rope holder”. Method: Sure, you’ll have to stand through rounds of jumping challenges, BUT it definitely beats leaping several feet off the ground in an effort to jump on a waist high jump rope. You can even expertly get in more rest while playing this game by grabbing a chair and sitting through the first few rounds of the jump fest. If you fall within this category, you probably have family photoshoots every quarter with well polished kids, a clean house at all times and barely have to speak above a whisper. 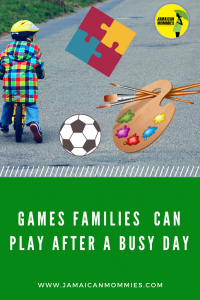 PLUS you have energy to TRULY PLAY. We salute you dear unicorn of the leagues of lazy mothers. 1. Role Play: Ranked high energy because this takes time. From picking out character themed outfits to getting into character, you have some serious energy mamacita! Method: Let your child take the lead. They likely already know just how their favourite character speaks, eats and sleeps. 2. Dance Fest: Think “I’m so excited and I just can’t hide it”! 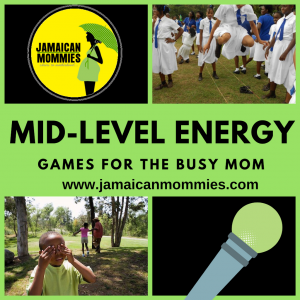 Often combined with role play, Dance fests, dance-a thons or whatever you label them require serious energy. Method: Try to stay on the beat. If you don’t you will be called out for it. You may as well dress the part as there will be demands for you to stay in character. Caution: If you are REALLY good at this, you will be called on REPEATEDLY to engage in a dance fest. CHEAT Sheet: Alternate high energy songs with slower, more laid back versions. That allows you to catch your breath between the rounds. 3. Catch: Don’t for a minute think you will just stand on the spot! Method: Wherever the ball goes, level up and aim to catch! 4. One, Two, Three…Red light: A local favorite where one person (“The Caller”) stands with back turned. Says 1…2…3… Redlight at varying speeds. While their back is turned, all players try to inch closer to the “caller”. If they are spotted mid movement, they are automatically out and the first person to reach the caller, wins the game and in turn gets the caller’s role. Method: Take turns being caller or player. Either way, this game continues to be fun for both adults and children.It is definately one worth keeping for family gatherings. So now you know, no energy? 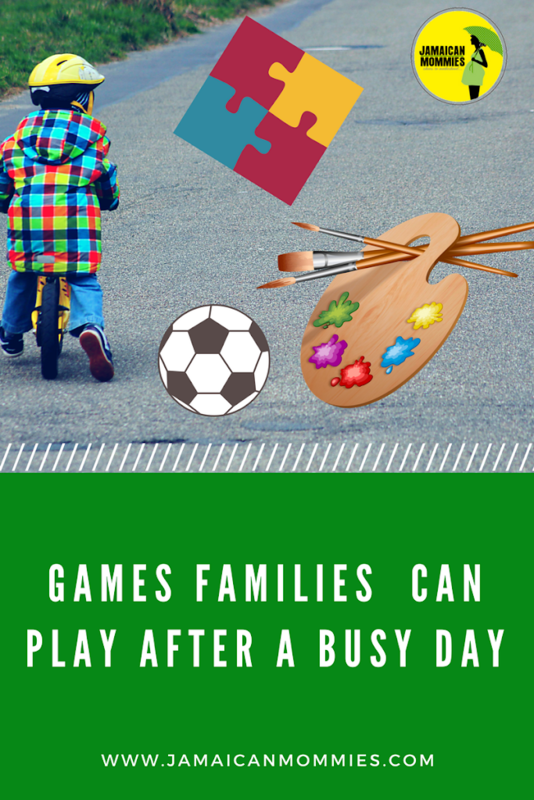 No excuse, Try one of our fun family games, even after a long day and this my friends is how you swiftly move from Zero to Hero. Next Next post: Jamaican Mommies Picnic promises day of play for entire family!